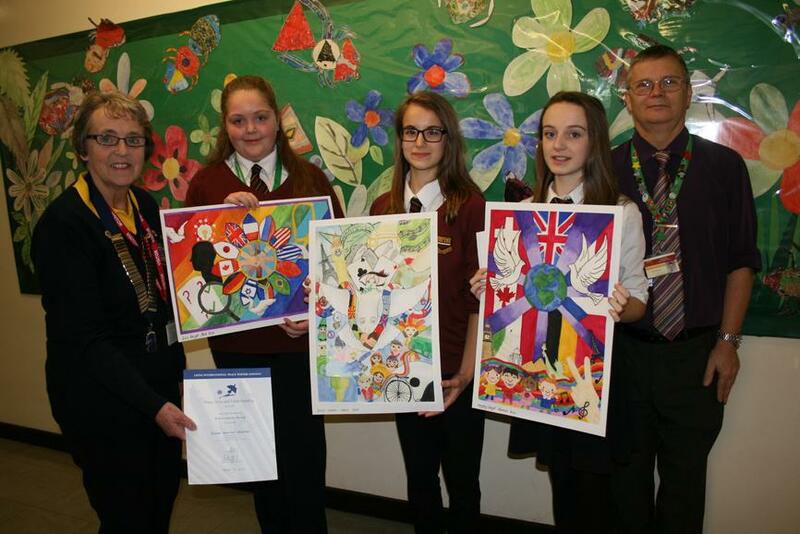 Congratulations to Elise Warner-Deards for being chosen as the Hugh Sexey Middle School winner of the Lions International Peace Poster Competition 2014-15. Well done also to the two Runners up: Lois Keift-Perkin and Hayley Lloyd-Jones, and to all of the pupils in Year 8 who took part in this annual competition, which is sponsored by the Cheddar Vale Lions Club. The posters are judged on their originality, and artistic merit and portrayal of the theme, which this year was “Peace, Love and Understanding”. The judges were particularly impressed with the thoughtful way in which pupils had expressed the theme. Cheddar Vale Lions President, Judith John, presented Elise, Lois and Hayley with a prize for their posters at the Key Stage 3 assembly on Friday 28th November, along with a certificate of appreciation to Mr Motion for the school. Elise’s poster will now be entered into the next level of the competition, where a SW District winner will be chosen. Should she be successful at this stage, her poster will continue on to the national and then international levels. Good luck, Elise, and well done to everyone who took part in the competition this year.